Filter belts with a plain and a three-shaft twill weaves. One of their advantages are excellent dewatering properties. Apertures are perpendicular to the fabric surface, which makes the fabric easy to clean. Filter belts for gravity belt thickeners are usually made of abrasive resistant polyester. 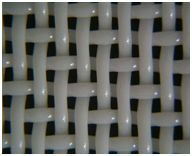 Filter fabrics with the plain weave have high weave stability and predefined uniform size of apertures, so they can also be used to sort particles according to their size on LINEAR SCREEN separators. Filter fabrics with the three-shaft twill weave have a very high dewatering ability and a higher wear resistance than fabrics with the plain weave.